Baby boomers have always been the pig in the python, refashioning the culture and environment around them. In the early ’60s, it was an increase in building elementary schools for them; in the ’70s, it was the uptick in college admissions. Now it’s adapting retirement homes to their tastes and passions, especially in regards to their stomachs. According to the Population Reference Bureau, there were approximately 76 million births between 1946 and 1964. Around 65.2 million are still alive, making up 24 percent of the population. That’s a number worth addressing. Today’s senior citizens are living longer, in part for eating healthy, fresh, organic and local foods coupled with less fat and sodium. 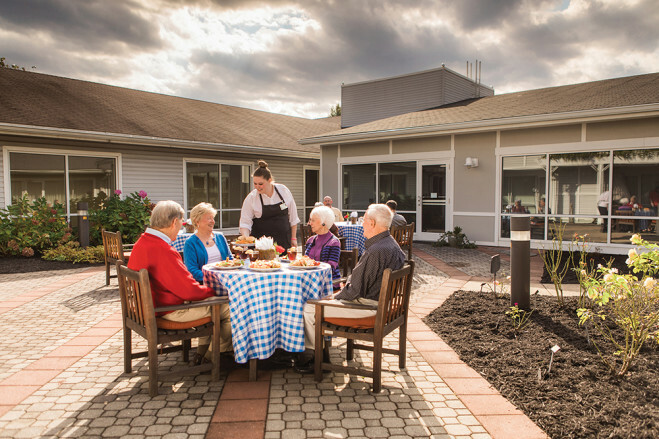 Many are choosing retirement communities at an earlier age, and management is incorporating healthy changes into their dining options. Many of the retirement communities in the New River Valley and Roanoke region are responding with more choice, adopting healthier recipes and using local foods in season. Some, like Brandon Oaks of Roanoke and Warm Hearth Village in Blacksburg, even sponsor farmers markets on site, so not only residents and staff can buy locally and fresh, but chefs as well. Brandon Oaks has Homestead Creamery visit once a week so residents can stock up on good, local, dairy products. Sometimes there’s a restaurant on site like the Fireside Grill and Huckleberry Cafe at Warm Hearth Village. Brandon Oaks has The Grille. You can also find Grab-and-Go stations with packaged sandwiches, fruit, pudding, snacks and treats. Tobie Bowe, director of dining services at Brandon Oaks, says: “It’s important to keep it fresh and interesting.” There are fall-winter and spring-summer menu cycles, and dishes rotate every five weeks. Holidays generate special menus. There are Friday night cookouts and barbeques in warm months, and one Sunday a month brings a champagne brunch, a big favorite with waffle and omelet stations. It wouldn’t be the 21st century without some technology, and residents have apps to use in the dining room. Bowe introduced The Bite System, which works with the kitchen’s online menu to calculate various factors, such as calorie count, fat and sodium content and vitamin percentages for each food item being served that day. Residents bring the app up on their phone or tablet, plug in the amounts they ate and find out exactly what nutritional needs were met. Becky Hepler is a retired high school librarian and freelance writer who lives in Giles County.